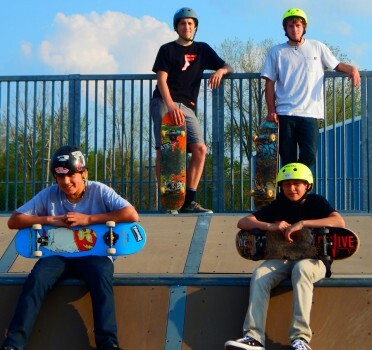 The outdoors is calling and area skateboard enthusiasts are spending more time under the sun at Kosciusko County skate parks. Mantis Skate Park in Warsaw and Syracuse Skate Park have been filled with the crashing sounds of wheels hitting the ramps. Mantis Skate Park is now opened for the season. From now until June 7, the park will be opened 4 p.m. to 8 p.m. Tuesday, Wednesday and Friday. Weekend hours are noon to 6 p.m. Saturday and 2 p.m. to 6 p.m. Sunday. Local patrons didn’t waist any time returning to their favorite location. Logan Vector of Warsaw has been skating for 10 years. As a more seasoned skater, he offers advice and tips to his younger peers like Nicolas Lariou-Hernandez and Alec Gayney. Both Lariou-Hernandez and Gayney have fun “trying new tricks” and sharpening their skills. Self proclaimed park pros take a break for the camera at Mantis Sake Park, Warsaw. From left are Nicolas Lariou-Hernandez and Alec Gayney. Standing are Alex Hernandez and Logan Vector. Competition dates this year are as follows; Big Trick Contest, 1 p.m. to 4 p.m., Saturday, June 27, and the 2015 competition, 9 a.m. to 1 p.m. Mantis Skate Park is located at 400 Little League Drive, Warsaw. For more information visit Warsaw Parks Department online at www.warsaw.in.gov. Syracuse Skate Park is the perfect playground for teens and young adults who enjoy skating or BMX riding. Designed for skateboards, in-line skates and bikes; it draws people from all directions. 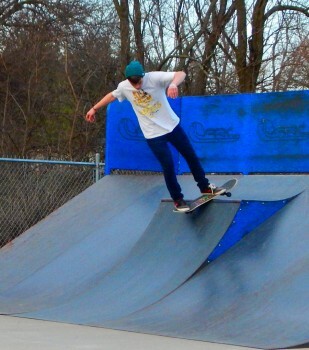 Bryant Raney drives from Goshen to Syracuse Skate Park to experience a variety of ramp designs and materials. Bryant Raney of Goshen said he drives to Syracuse for the variation in the ramps. “The ramps are metal and it’s different to skate on than wood or concrete.” Like most skaters, Raney flips, grinds and spins his board for fun. Syracuse resident and National Guardsman, Kris Marquart skates as a retreat from work and daily obligations. “I come out here to get away. I don’t have to think about anything else. It’s about having fun and being with friends,” said Marquart. 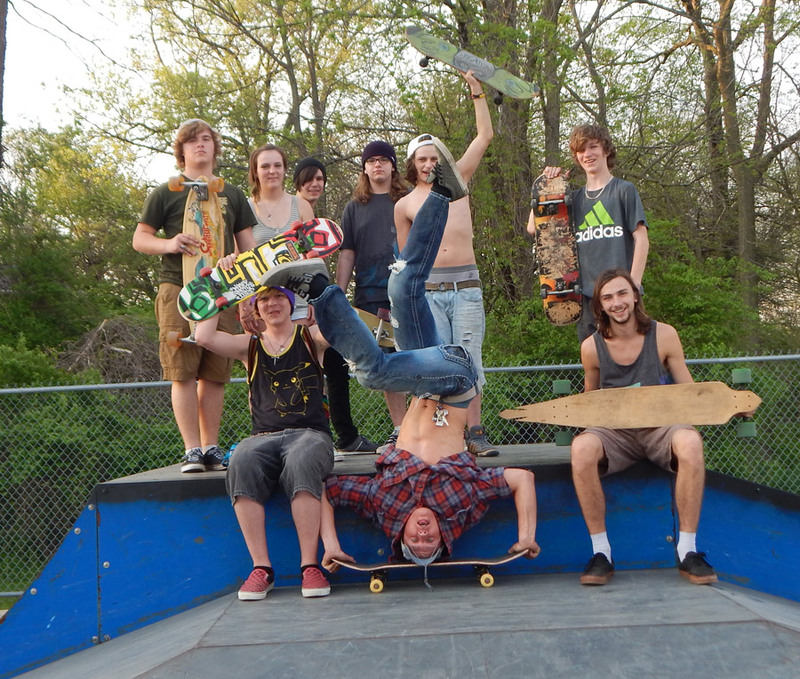 Syracuse Skate Park is located at 1013 N Long Drive and is open seven days a week. 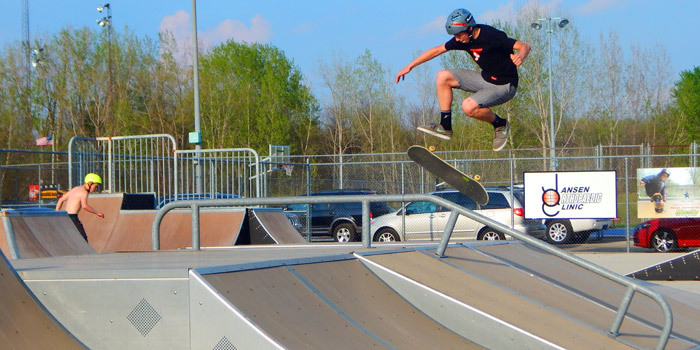 Syracuse Skate Park was filled with teens on skateboards and bikes last week as the temperatures reached season highs. Kris Marquart is surrounded by friends as he does a hand stand on his board.